Today’s guest blogger is Matthew Haley, Specialist in Fine Books and Manuscripts at the auction house Bonhams. One of the most curious items in our auction on December 2, 2010, is the first book produced in its entirety in the Montana Territory. It is an account by John Allen Hosmer of an 1865 trip he took with his family from Virginia City, Montana, to Detroit, Michigan. The means of transportation included a wagon, a raft down the Yellowstone River, a steamer on the Missouri River, a stagecoach, and the railroad. 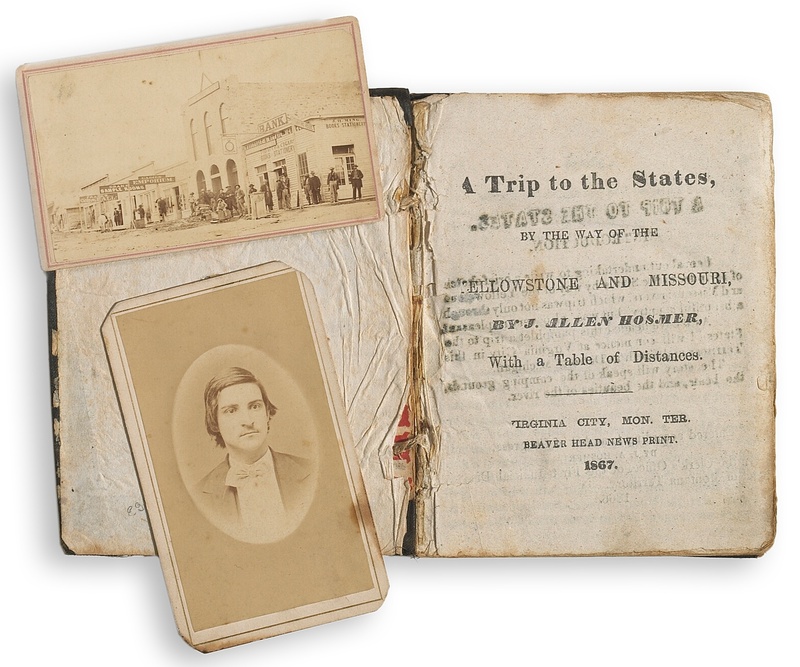 Apart from being an exceptionally cute little book, Hosmer’s “A Trip to the States by Way of the Yellowstone and Missouri” is also exceedingly rare. Nobody knows how many copies were produced, and since it was printed on crude newspaper stock, very few are believed to have survived—in the 1950s, the bibliographer Howes found only nine copies. Only one copy appears in the auction records, which is, indeed, this copy; it was previously sold at auctions in 1968 and 1999, and was in the celebrated library of Americana collector Thomas W. Streeter. Seeking certified rare book appraiser, and specialist in Limited Editions Book Club. Own collection in excellent condition, from approx. 1953 – 1965. Would like to have 3-5 independent appraisals done. I will provide my phone number after I receive your replies with weblinks for your appraisal business. Thank you. “ ” We’d sell all kinds of cat designs—holy crap, so many cat designs!